Snacks for bodybuilders usually follow a few simple rules. They are often high in protein, low in sugar and, in general, are healthy foods. A good bodybuilding snack should shoot for around 15 or more grams of protein, with an equal or lesser amount of carbohydrates. Some common bodybuilder snacks include dairy products, fruits and vegetables and whole grains. Eggs contain 6 grams of very high quality protein, making them a great addition to any muscle building program. You can devil your eggs by hard boiling them, peeling them, cutting them in half and then mixing the yolks up with mayo (or Greek yogurt), mustard, salt, pepper, paprika and other spices before putting the mixture back into the hollow of the egg half. 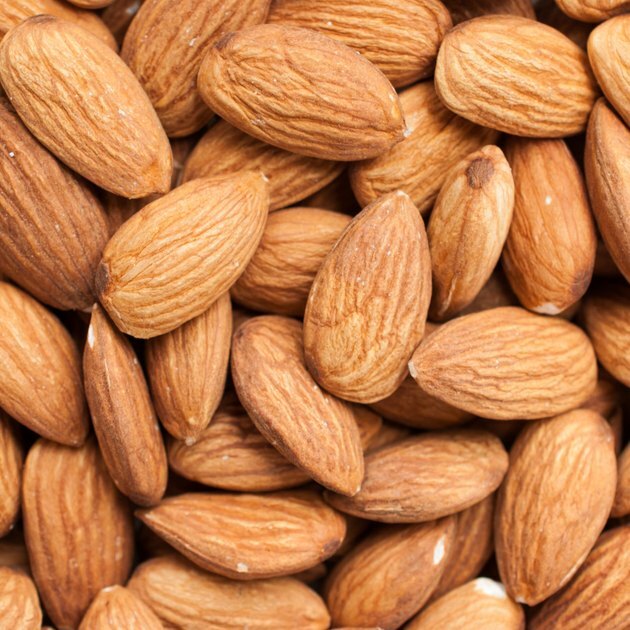 Almonds contain healthy fats that are necessary for good health. Each serving also provides 6 grams of protein and 210 milligrams of potassium. According the Colorado State University Extension office, potassium is important for athletes because it can help prevent muscle cramping and cardiovascular irregularities. Cottage cheese and Greek yogurt are both very high in protein, but very low in sugar, making them an optimal choice for a bodybuilder's snack. One cup of low-fat cottage cheese contains 31 grams of protein and just 1 gram of sugar. Cottage cheese and Greek yogurt also both contain complete amino acid profiles, making them ideal for bodybuilders looking to build muscle mass. Fruits and vegetables are high in fiber and nutrients. Snacking on them is a great way to get many of the vitamins and minerals necessary for muscle growth. The Weston A Price Foundation notes how important vitamin A (found in many vegetables) is for testosterone production and muscle growth, calling it “The forgotten bodybuilding nutrient." Deli meat rolled up with a slice of cheese is a high protein snack that lacks the carbohydrates and sugar of a traditional sandwich. For example, a turkey and Swiss cheese roll-up from one sandwich shop chain contains 30 grams of protein, with 9 grams of carbohydrate and 5 grams of sugar. Beef jerky is a very convenient and portable snack that contains 15 grams of protein per ounce, with 3 grams of carbohydrates. Hummus is considered a good bodybuilding food because it's healthier than many other dips. With 5 grams of protein and 117 calories per 4 ounce serving, hummus is also a good source of both potassium and iron. Add your favorite healthy crackers to complete a simple and tasty muscle building snack. Oatmeal contains complex carbohydrates, which are digested slower than simple carbohydrates. This means the body can use them for energy over a longer period of time. Bodybuilders commonly use oats and oatmeal as a dietary staple. Throw in some berries for added flavor and to boost the nutritional value. Protein shakes are ideal because they allow you to build your own flavor profile. Combine a small banana, Greek yogurt, peanut butter, old fashioned oats, milk, chocolate protein powder and a few ice cubes for a great tasting chocolate, peanut butter, banana protein shake.